MARRIOTTSVILLE, MD – There comes a time in everyone’s life when you realize it’s time to go out on your own… branch out… leave the nest… blaze new trails. How ‘bout starting a new career? That’s a little tougher, at least for some. 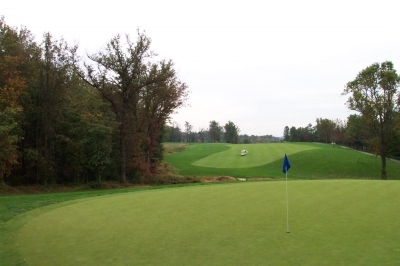 You'll need to carry it there to Waverly Woods' 445-yard, par four 17th hole. 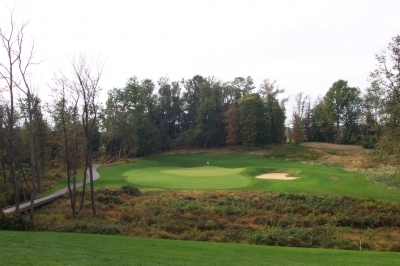 In the case of Waverly Woods Golf Club, in Marriottsville, Maryland (about 25 minutes west of Baltimore off of I-70), a son took it upon himself to win a golf course design project, start the work, and bring in his father to add his expertise. It was every person’s dream. It’s a case where the protégé knew it was time to take charge of his own destiny, and seized on it. Though in all fairness, the ‘kid’ involved here was well past the age of majority and independence, and the father was grateful for the son’s forthrightness. Well respected golf architect Arthur Hills has been designing golf courses since 1966, but it was his son, Joe, who deserves most of the credit for the evolution of Waverly Woods. “To me, the story of Waverly Woods is how Joe put things together at such a young age. For a young man in his early thirties who’d never designed a golf course before – to first sell the idea to a developer, gather a bunch of investors to back the idea, then to be a major contributor to the design of the golf course itself… well, I think that’s pretty remarkable,” the older Hills said. The shortest hole on the course, the par three fifth (142 yards) -- still requires proper shot selection and execution. For Joe Hills, it was much more than a case of slick salesmanship and a ‘hope’ of consolidating matters under the protection of his father’s reputation. Arthur says Joe’s a pretty smart guy, and it would take all of that savvy to bring everything together in this fast growing location in Baltimore’s western suburbs. “So I made a pitch to build the golf course for them, which they embraced, because they needed to get it completed in order to get their permitting for the housing,” Hills added. A silent reminder of the land's past is this 19th century corn crib on the right side of the practice range. Sure, he’d gotten the job, but how would he get the money to build it (the golf course was to be a separate financial entity to the real estate)? Hills said they put together a private placement memorandum, then hit the pavement to present the proposal to some potentially interested partners. The group eventually grew to about twenty investors. Hills then hired well-regarded Wadsworth Construction to move and shape the dirt and his father to provide the design know-how, and the rest is history. Joe Hills still acts as the facility’s Managing Partner, and his company runs the day-to-day operations of the golf course (along with partner Tom Healy). 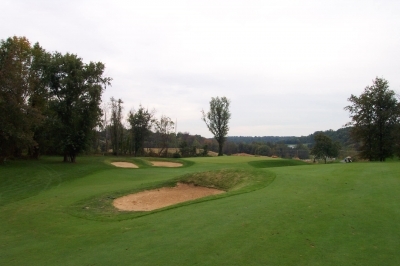 Since opening in 1997, Waverly Woods has become a Baltimore/Washington local favorite, notorious for its excellent playing conditions and fun-to-play layout. The course’s setting hasn’t hurt its success. Arthur Hills said it was pretty much virgin land when they first built the layout, and one can only imagine just how beautiful and pristine it must’ve looked back then. In 2005 it’s still superb – especially the back nine – but there’s also a burgeoning residential community rapidly filling in the corridors. There aren't many bunkers at Waverly Woods, but these are strategically placed on the par five 11th hole. House golf it’s not, but the neighbors might be watching, nonetheless. There’s history, too -- the name ‘Waverly Woods’ stems from the name of the original farm which occupied the land, Waverly Estate. The Waverly Mansion’s there, too, which dates back to the 1750’s – built by a man named Nathan Dorsey. The property was later sold to Revolutionary War hero, Colonel John Eager Howard, Governor of Maryland in the late 1780’s, and then by succession to another of the state’s Governors, George Howard. Howard named the estate Waverly, after the Sir Walter Scott novel of the same name. 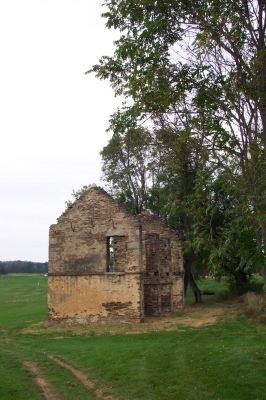 Also residing on the course property itself is the ruins of an old corn crib (one of Waverly’s outbuildings, related to the original estate), which stands to the right side of the practice range – and the old barn’s image is Waverly Woods’ logo. A nice historical touch, all around. From behind the par three 7th hole -- the golf still dominates the landscape, but there are also a few homes to share the scenery. Arthur agreed with his boy’s assessment: “He’s got architectural ideas, but he had fewer of them at that point then he does these days. Now he thinks he knows it all – and he does know a lot. He’s a bright guy. I get nervous when I get around somebody that smart,” the elder Hills said humbly. Joe Hills says the short par four 12th hole (370 yards) is probably the most difficult at Waverly Woods -- and that's because the second shot must scale a considerable slope to get to this point. “On future projects, I’ll be doing most of the design work myself,” Joe reiterated. A few things have changed at Waverly since opening. According to Joe, they’ve expanded some grassed areas, widened some landing zones and done other little things to make it more playable and friendly to all levels of golfers. You’ll notice when playing that there’s plenty of room to play the ball, despite some of the fairly narrow looking corridors. There’s still a lot of lost ball potential here, though, if you’re hitting it as wild as I did the day we played. But the forced carries are minimal, even from the back tees, and most players should enjoy playing from their original tee shot locations. 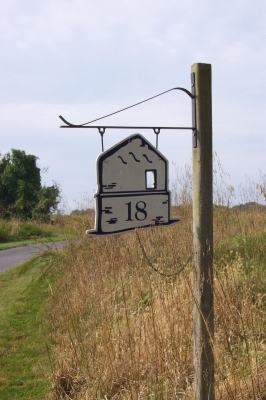 One of the nice personal touches at Waverly Woods -- hole signs with the historic barn as the logo. Arthur was right -- Joe must be brainy if he sees things on a below-conscious level. The par five 2nd hole (549 yards) doglegs left from the tee, and requires three well placed shots to earn a birdie chance. Whether you’re ‘enlightened’ or not, there are a couple things at Waverly Woods that’ll take some getting used to. Because they didn’t move a lot of dirt here, there are a few holes where you’re not sure where to hit the ball – bringing along a yardage book is a big help in this regard. Joe Hills said there were some situations during construction where they’d normally make a big cut out of a hill, or fill in some swales – but they left the lay of the property the way it was, in more of a natural, old-style golf design. 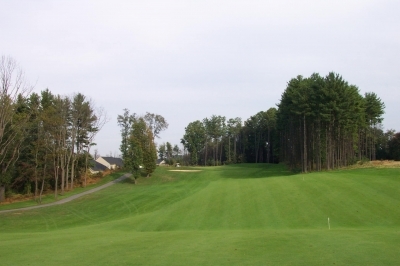 The other things that make the Waverly Woods experience are service and course conditioning. Service, because Joe says the entire reason they’re in the golf business is to make things fun, and conditioning because that’s what you’ll come to expect from an upscale golf club designed by Arthur Hills. Thankfully, Waverly Woods has both. Waverly’s reputation is for offering some of the best turf conditions in the Baltimore/Washington area, and they don’t disappoint. The only stand of pines at Waverly Woods, the par four 16th hole's green is surrounded by 'em. Hole highlights include the first hole (which originally was number ten), a 378-yard, straight-on par four that looks narrower than it is. The key feature of this hole is its raised green, which will introduce you to the need to hit it high and land it soft on this golf course. 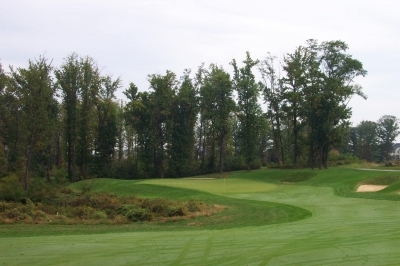 Four is probably the most ‘controversial’ hole on the layout, but it’s also both father-and-son Hills’ favorite at Waverly Woods, because of a large grassy hump that protects the green. If you don’t place your drive in the right spot on the fairway, you won’t have a good angle into this blind green, so there’s a premium on accuracy for both the drive and second shot here. The fifth hole measures only 142-yards (par three), but this sloping green will really test your short iron shot-making skills. 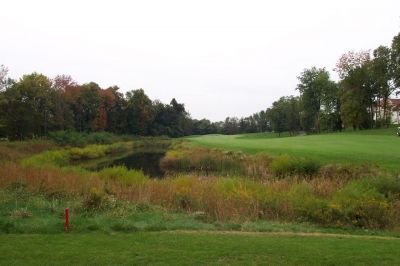 This pond and wetlands will certainly influence your second shot decision-making on the par five 8th hole. 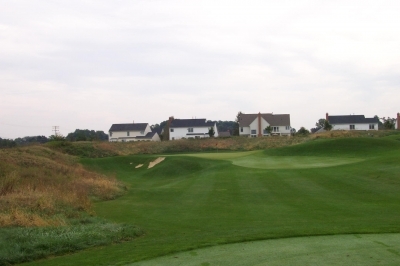 On the back side, Joe Hills says the twelfth hole is probably the most difficult on the course, despite only stretching out to 370-yards in length. You can certainly club down off the tee to position it to the left side of the fairway, which provides a flat lie for the approach shot. You’ll need all the help you can get, as the second shot’s straight uphill – and don’t leave it short or go long, either. Talk about pressure. 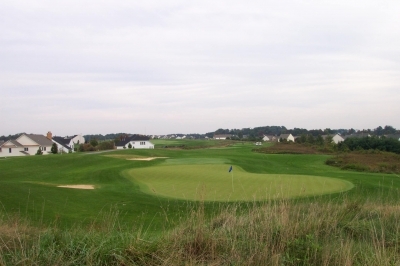 Waverly Woods truly belongs in the upper echelon of upscale public golf courses in the region. Its conditioning, service and layout are well thought-out, and ensure that you’ll have a good day on the golf course. The fact it’s the ‘break-out’ project for Joe Hills is a bonus, and shows that sometimes, you just know it’s time to go out on your own. Note: Check the links below for more reviews of courses near Waverly Woods. Range balls are included. The course is very walker-friendly.